A quitclaim deed executed in Utah must be signed by each grantor involved in the conveyance. A certificate of acknowledgment, proof of execution, jurat, or other certificate may be required in order to effectively record a quitclaim deed with a county recorder. 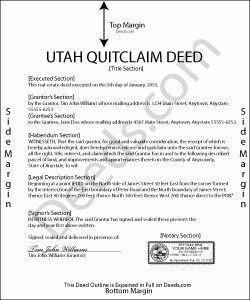 A quitclaim deed may not be presented to an appropriate county recorder in Utah unless it contains a legal description of the real property, names the grantee, and recites a mailing address for assessment and taxation. Additional requirements may apply to a Utah quitclaim deed. For a thorough discussion, visit the county links, or go to the Utah Revised Code. When a quitclaim deed is recorded in the county where the property is located, notice of its contents is imparted to all persons (57-3-102). The recording act in Utah stipulates that if a quitclaim deed is left unrecorded, it is void against subsequent purchasers of the same real property or any portion of it if (1) the subsequent purchaser bought the property in good faith and for valuable consideration and (2) the subsequent purchaser's document is recorded first.